This is a game that is being enjoyed by millions of people across the world. Moreover, 3.8 million Brits are enjoying this game online and in bingo halls. Even though the origins of bingo in the United Kingdom are covered in mystery, this game has been played in one form or another for many generations and has been a favourite for the ones who wish to get out of their houses and socialise without the need to spend a tonne of money. So, if you are wondering about the history of bingo – where did it all start? continue reading our article. As far as we know, Bingo comes from Italy, and its predecessor is probably the Italian lottery called the “Lo Giuoco del Lotto D’Italia.” The game was altered and adapted as it spread from country to country. For example, in France it was called “Le Lotto”, and it was a favourite of the French aristocracy. We will not recognise these bingo games, but the closest forms of the game were the ones that were played in Germany in the 19th Century, which was used as an educational tool to make learning fun for kids. It helped teach children numbers, spelling, multiplication tables and history. In the United States, bingo used to be played in carnivals, and the players shouted Beano instead of Bingo. In 1929, Edwin Lowe went to a festival in Atlanta, and one of the games grabbed his attention. He was simply mesmerised by how it allured the players as well as the level of engagement and involvement that players had. Many of them did not stop playing until they were told to leave when the carnival closed at 3 am. The businessman took the game to New York and refined it to use beans, numbering stamps and playing boards. 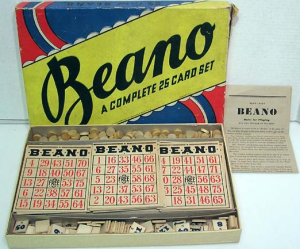 Later on, the name Beano was immediately discarded as one of the entrepreneur’s friends accidentally called out Bingo when she won a game. And this is the name has remained with us until today. Lowe continued his travelling across the United States to spread the game even more. Moreover, by the 1940’s the entire country was enjoying the game. Bingo used to be known as fun and easy going and became a popular gambling game with small stakes, which was used mainly used at charity auctions, for fun at home and many other similar events. However, the bingo we know here in the United Kingdom is played with a different structure. The British version was growing alongside its American counterpart to make it become a global phenomenon. As technology was advancing, so did bingo with more sophisticated draw machines which were paving the way for computerised RNG’s as well as no human influence in the strictly regulated games. Bingo kept growing until it became one of the most popular global games. Moreover, since its nature is easy and simple to pick up, it became favourite to people of all characters and ages. It is both widely played by adults and children, but the betting aspect is also quite popular, and jackpots and prizes often reach thousands of pounds in both bingo halls and online. Since the format of the game is very adaptable, it is easy programmed to the internet, which is a huge factor in its huge success in today’s digital age.